Beans have never been a staple in my diet. Canned beans can taste metallic and dry beans require too much advance notice to prepare. Truth be told, I think all the cold bean salad recipes floating out there had tarnished my desire for beans. However, time and time again I read how wonderful beans are for your health. They’re complex carbs that keep you full, lower your cholesterol, and are packed with protein. So I finally gave in and started to make beans. I came up with a recipe that is so good, that I’m excited to soak my beans in advance! 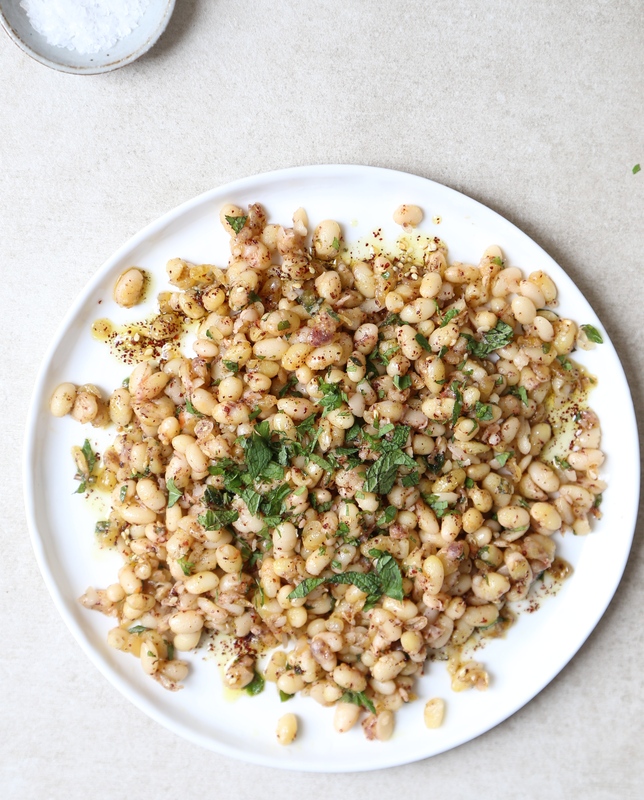 My recipe for Pan-Fried Zata’ar Navy Beans is so simple and insanely delicious. Zata’ar is a Middle Eastern spice commonly made up of dried herbs such as thyme, marjoram, and oregano, as well as toasted sesame seeds and sumac. I love the sour notes of sumac and it’s beautiful deep red colour. It can make any dish look and taste interesting, which is why I added a bit extra sumac alongside the zata’ar in this recipe. Sumac and zata’ar are available at Middle Eastern markets or if you’re lucky in the spice aisle of your grocery store. Soak beans for at least four hours or overnight. Place beans in a large pot with 4 cups of water. Bring to a gentle boil and cook for 30 minutes until tender but not mushy. Drain and set aside. Meanwhile, prepare the dressing. Whisk together ¼ cup olive oil, lemon juice, lemon zest, zata’ar, sumac, red chili flakes and salt. Set aside. Heat a frying pan with 2 tbsp of olive oil over medium high heat. Add the beans and garlic. Fry for 4-6 minutes until hot and beginning to crisp. Remove from heat and toss with dressing and season as necessary. Garnish with mint. Serve immediately. This entry was posted in Starters/Sides and tagged dri, heart health, middle eastern, navy beans, sumac, Vegan, Vegetarian, zata'ar. Bookmark the permalink. Unbelievable recipe, and so easy to make. I made these last night and really enjoyed!! Will definitely make again soon!